What does an IMA battery problem look like? You can tell how much usable capacity the Insight’s battery has by observing the range of its state of charge (SOC) gauge. A healthy battery will move through the entire range. As the battery degrades, it will move through fewer LCD bars on the gauge. 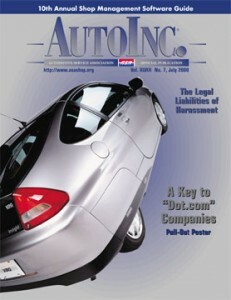 A check engine light will come on with the P1447 code once the battery’s capacity is reduced. The light comes on when the dash read out moves through only about 5-6 bars on the gauge. You will want to do preventive maintenance on an IMA battery even if you don’t have a check engine light to obtain a longer life span and keep the IMA light off. What goes wrong with IMA batteries? 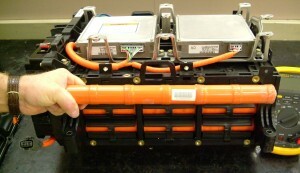 Honda IMA batteries consist of a large number of NiMH cells in series. Due to unequal rates of self-discharge, some of the cells will have a higher or lower state of charge than others. This is easy to correct with the ACDC HBB, but failure to do so results in diminished battery capacity, and can damage the cells that are too high or too low. One of the treatable problems that will diminish the cell’s capacity is the formation of nickel dendrites in the cell. Rapidly charging and discharging a cell through its full range can help restore its performance. How can the ACDC HBB fix an IMA battery? Battery state of charge imbalance is not easy to treat. If you take a NiMH cell that is fully charged, and then continue to apply charging current to it, it will convert the extra current into heat. Provided that the current is small so the cell doesn’t overheat, this doesn’t appear to damage the cell. Thus if you apply a little charging current to an imbalanced battery, the cells that are high will peak first, and begin to convert the current into heat while the other cells catch up. The trick is knowing how much current for how long and what to do after the NiMH is now at 100% SOC. 100% SOC is not a good thing. This process works 80% of the time and our color manual brings you through it step-by-step. It is also recommended that you do this process yearly as preventive maintenance. The ACDC HBB is a non-adjustable voltage device at very low constant current. The manual was developed in-house and is as important as the HBB itself. If the battery is too far gone the HBB process will not fix the battery and it will need to be replaced. You will then need to replace the battery pack. Craig Van Batenburg is available after the sale to help you. As we use existing used electronic devices for parts to make this unit, they are quite limited in production. A 6 month warranty is provided by ACDC for replacement or repair. The HBB is only sold to ACDC trained HEV Technicians as it is potentially lethal. Call Craig to see if you qualify.